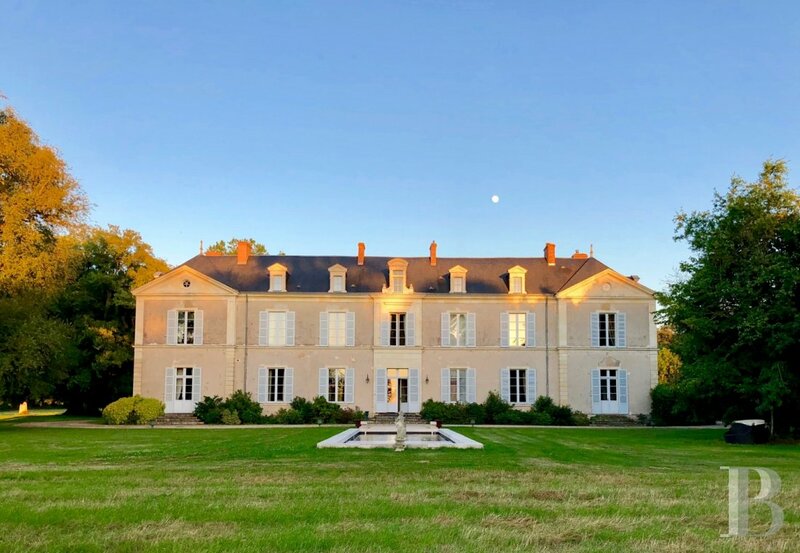 This chateau, set in authentic, rural surroundings, is near to the famous “Coteaux du Layon” vineyard and to the Loire Valley, classified as a World Heritage site by UNESCO. 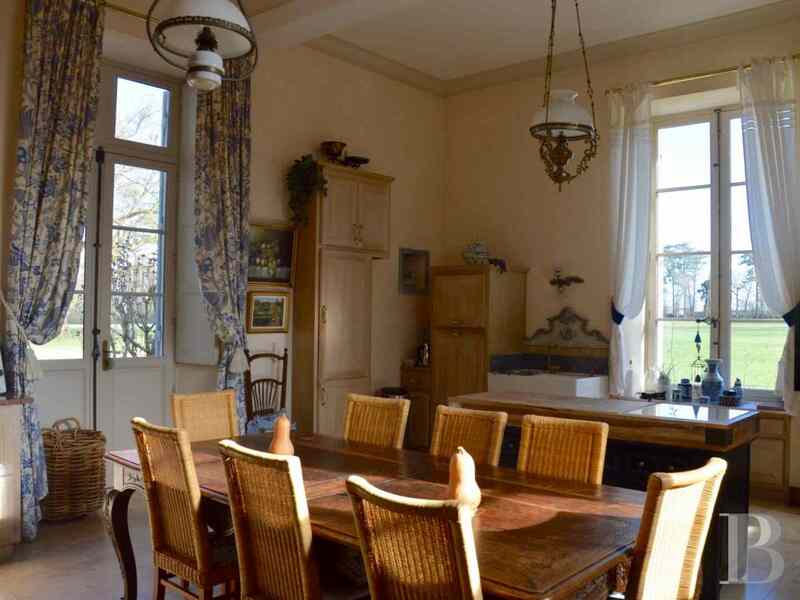 It is in the vicinity of two villages with shops and amenities. Three character towns are but 20 minutes away. 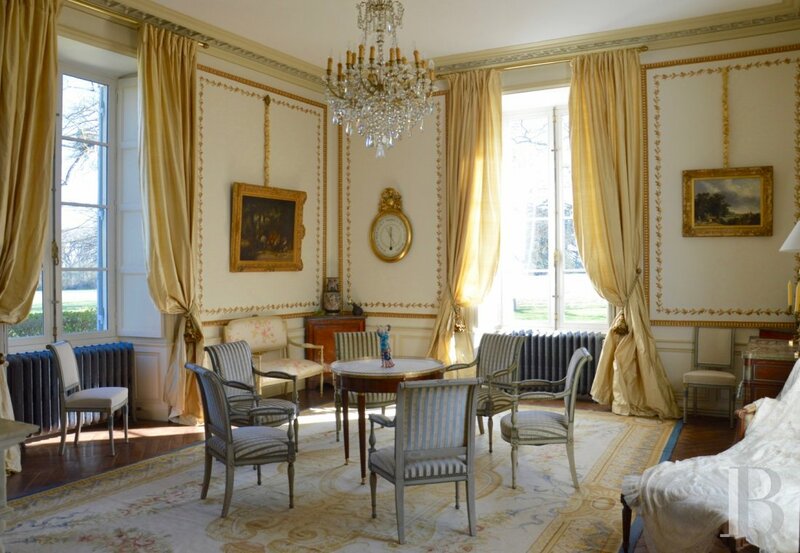 30 minutes from the town of Angers and its TGV train station, providing 80-minute links to Paris with more than 10 return journeys per day. Some 20 minutes from a slip road on to the A87 motorway. A secondary road leads to the gates providing entrance to this property. 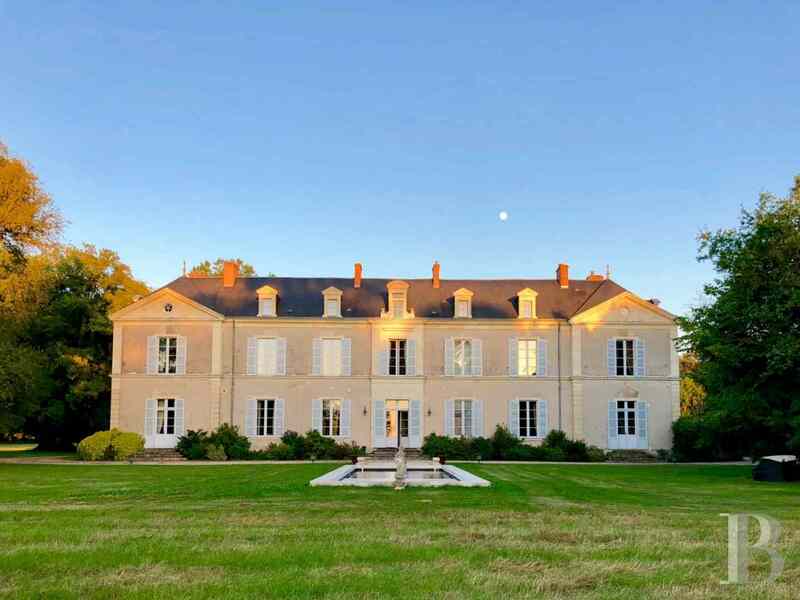 A long driveway crossing a wooded section of the parklands then leads to and goes around the chateau. 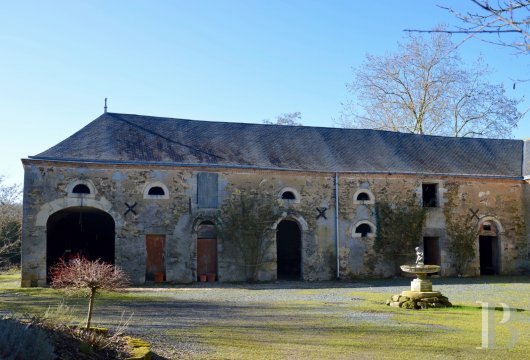 It also leads to a courtyard with the outbuildings, set back on one side of the building. A second entrance provides direct access to the outbuildings from the secondary road. 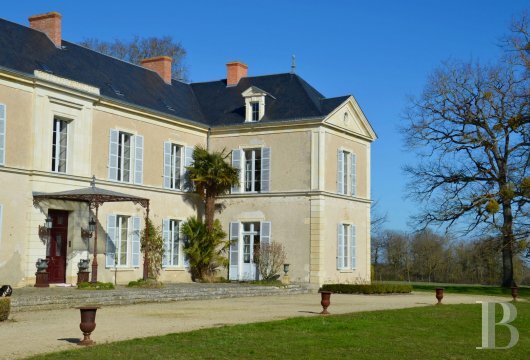 This chateau stands in the midst of more than 20 hectares of landscaped parklands, providing many superb views. 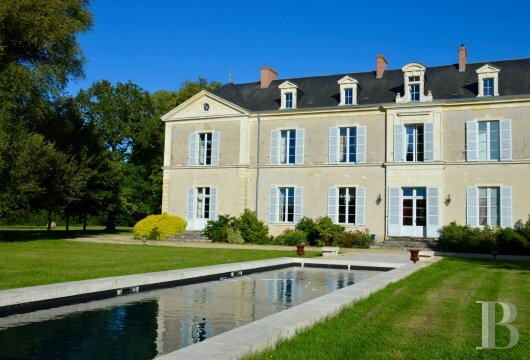 Built at the very beginning of the 19th century on the site of a castle dating back to the 12th century, this chateau comprises a central, rectangular building, flanked by two wings, delimiting a flagstone terrace in front of the main entrance and only slightly projecting on the rear facade. It spans a ground floor, a first floor and a second floor, topped with a hip slate roof. The gable walls of the two wings are enhanced with classical triangular freestone pediments, featuring an oculus. The openings, all with slatted shutters, are symmetrically laid out in relation to the central bays on each facade. The quoins, the cornices, the framing around the openings and the roof dormers are all made of freestone. 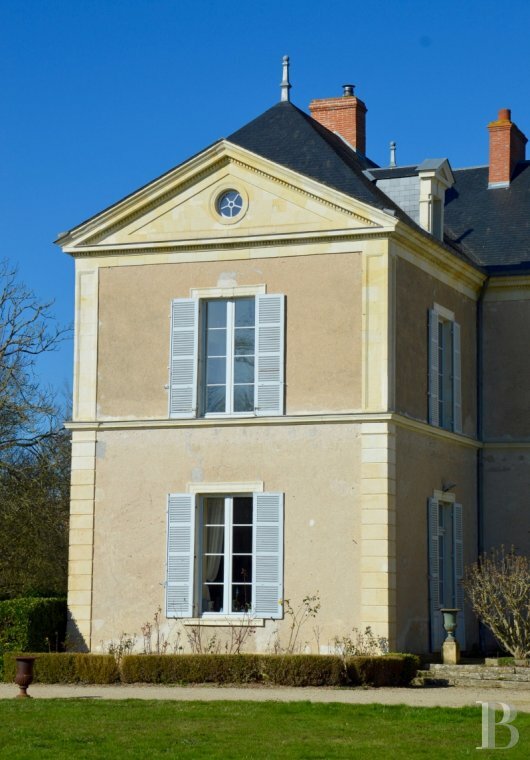 A freestone string course runs around the chateau under the first floor windows. The main front door, protected by a canopy designed by the Pinart-Frères company, is flanked by smooth freestone rusticated masonry. 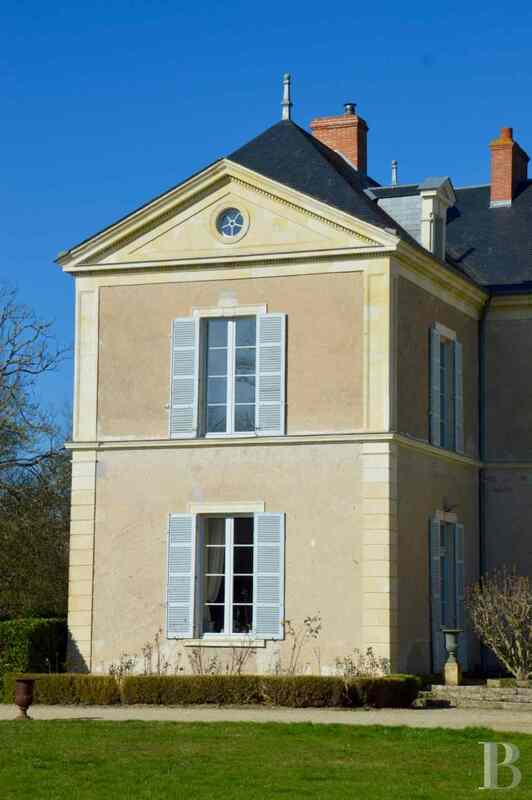 The wrought architrave around the window above the front door is worthy of mention. Its dentil cornice juts out and is topped, like acroteria, with a frieze sculpted with arabesques. 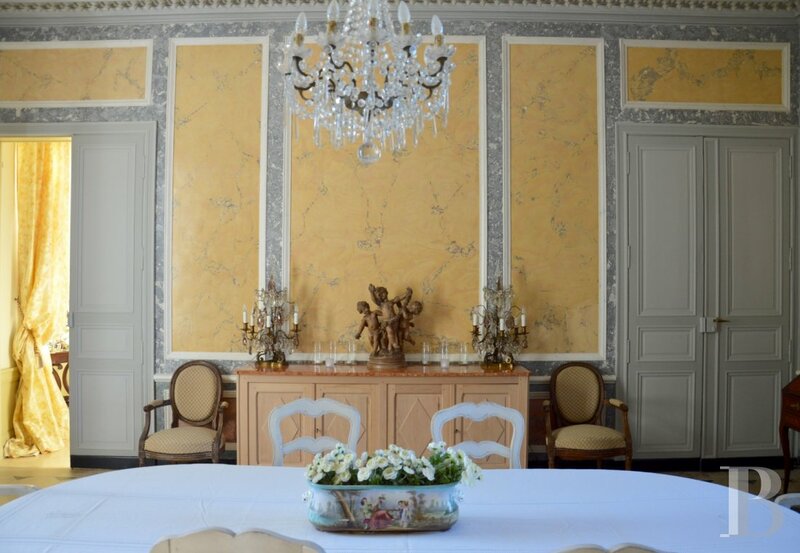 The entrance hall features a marble floor, painted decor as well as imitation marble on the walls and ceiling, which is enhanced with foliage. It provides access, straight on, to a study, then on one side, to a hall area with a pantry, a dining room, a billiards’ room and a lounge with, on the other side, a stairway, a toilet, a lounge-library and a hall area providing access to the kitchen, a small workshop a linen room, a toilet as well as a bedroom with its shower room. A bookshelf unit has been installed in the study which also has a white marble fireplace. 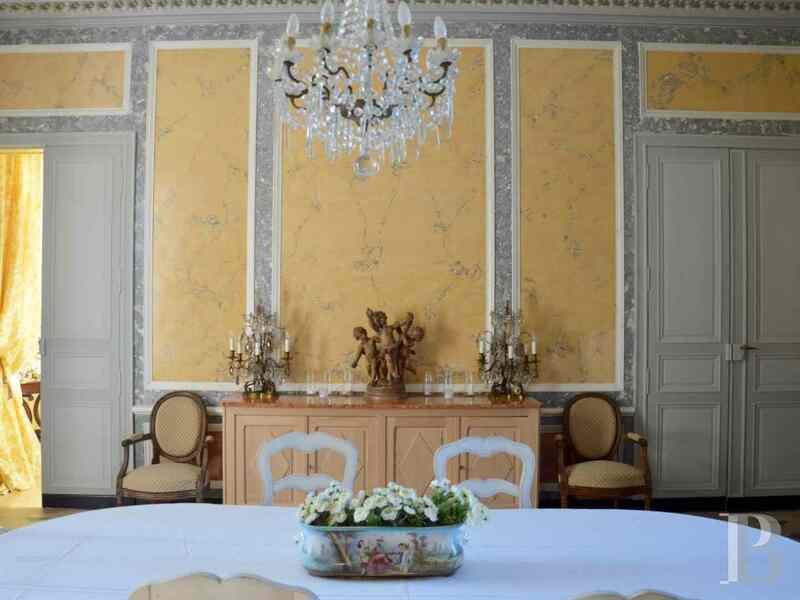 The floor in the dining room is covered with old tiles featuring inlaid decoration and the recently restored stucco decoration on the walls resembles marble. The central section of the moulded ceiling rose is made of cast iron. 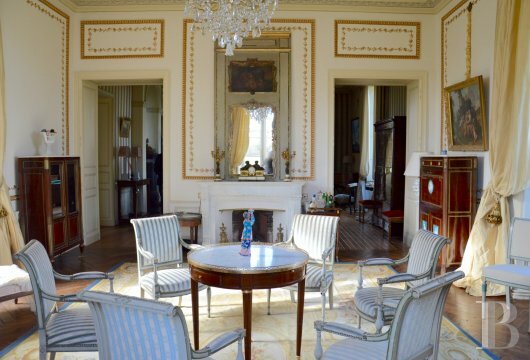 A fireplace made of marble from Angers completes the refined character of the decor in this room. The billiards’ room has strip pattern parquet flooring and a moulded ceiling rose that also features a central section made of cast iron. The lounge, equally as sophisticated as the dining room, has openings on three of its sides. It has randomly-matched parquet flooring and wall panels adorned with fine moulding, enhanced with gilded decorative foliage. 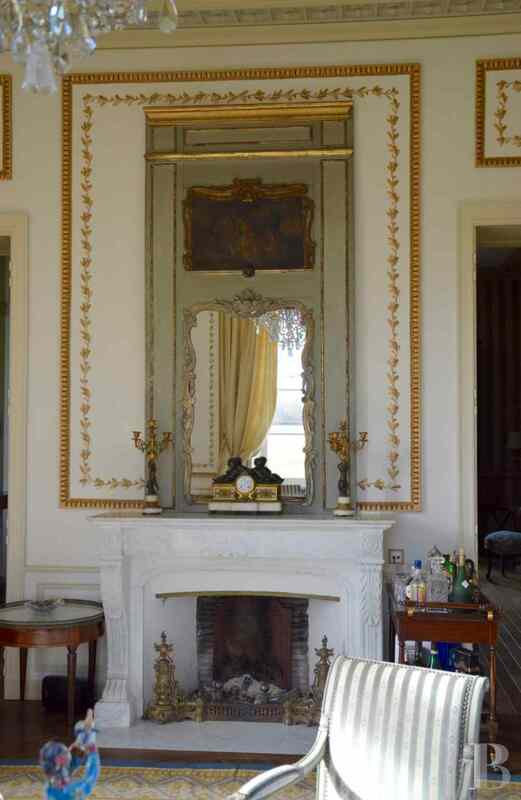 Its white marble fireplace has jambs supported on stylised lion claw feet. The wide, quarter-turning stairway is made of stone up to the first floor and of wood from this level up to the attic space. 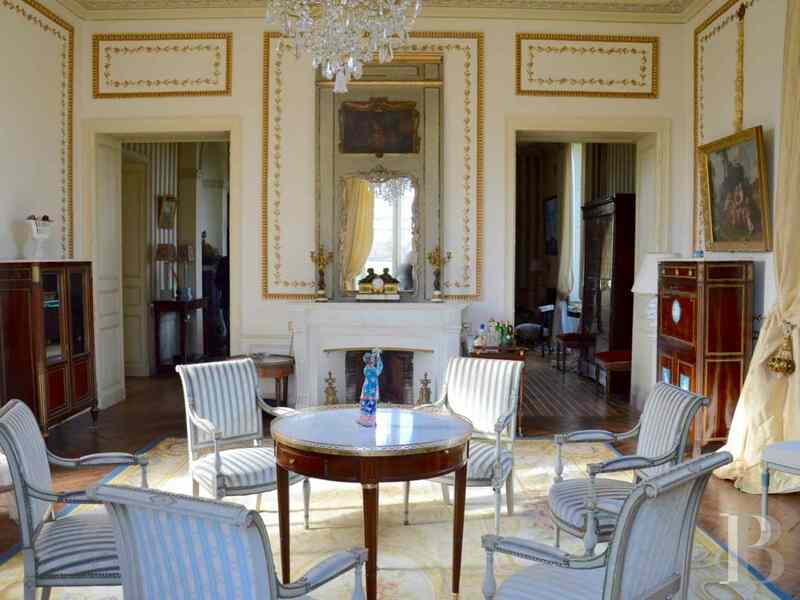 The lounge-library is enhanced with a Napoleon III style, painted wooden fireplace. 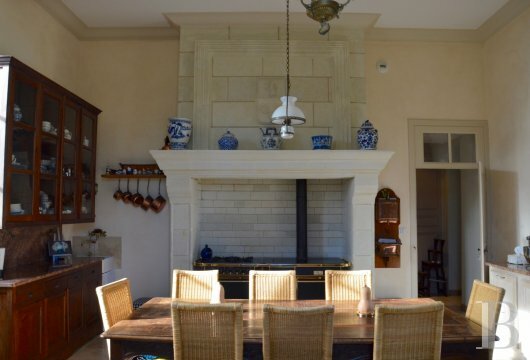 The kitchen features a monumental freestone fireplace and an old “potager” (a secondary hearth where soups and other previously prepared dishes were cooked on embers) with blue ceramic tiles. The linen room, with old cupboards, is on a half-floor with the small workshop above. The bedroom has its own shower room, fitted with a hammam. 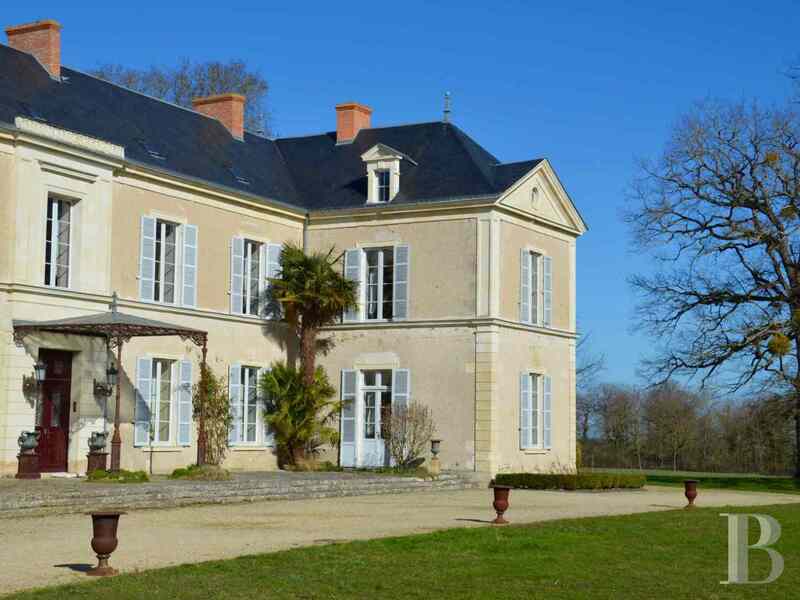 There are stone floors throughout the entire section of the chateau on the left-hand side of the main entrance. 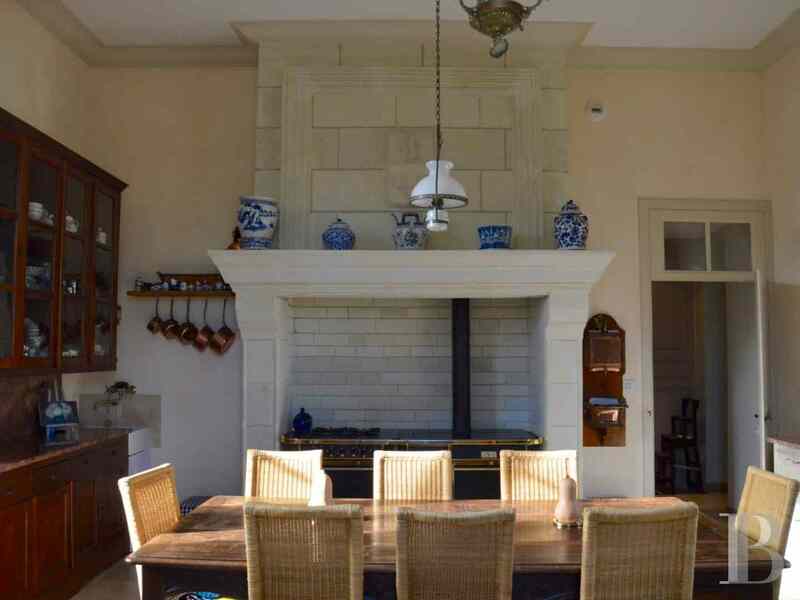 The lounge, the billiards’ room, the study, the kitchen and the bedroom, all have direct access outside, to the terrace for the lounge and the kitchen. Two cellars are to be found under the kitchen and under the lounge-library. The landing provides access to a corridor and a hall area. The corridor leads, in turn, to five bedrooms, three of which have a shower and toilet, whilst the other two have a private shower room and shared toilet. 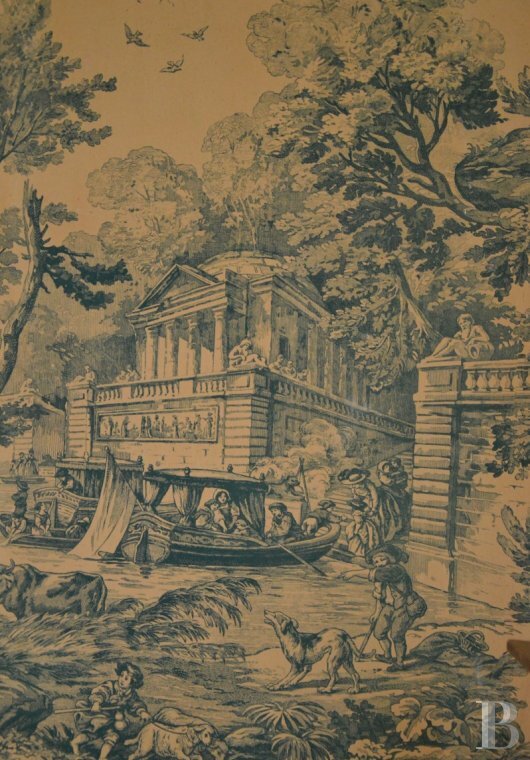 The hall area goes to two bedrooms, one of which has a shower room, a toilet and a dressing room, whilst the other has a shower room, a bathroom with a Jacuzzi bath, a toilet and a dressing room. The bedrooms have parquet flooring, whilst the shower rooms have marble floors. 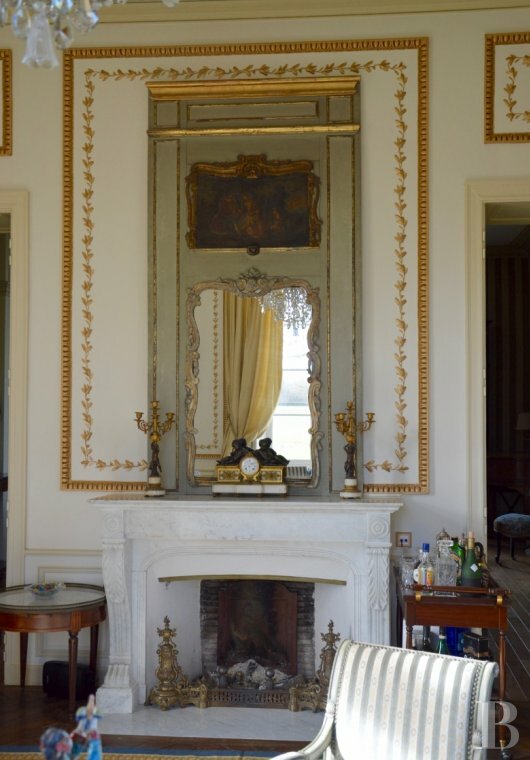 Six of the bedrooms have a marble fireplace. This landing provides access to a hall area and to the attic. The hall area leads to three bedrooms, all with their own shower room and toilet. Two bedrooms have terracotta floor tiles. The third bedroom has parquet flooring. The bathrooms have marble floors. 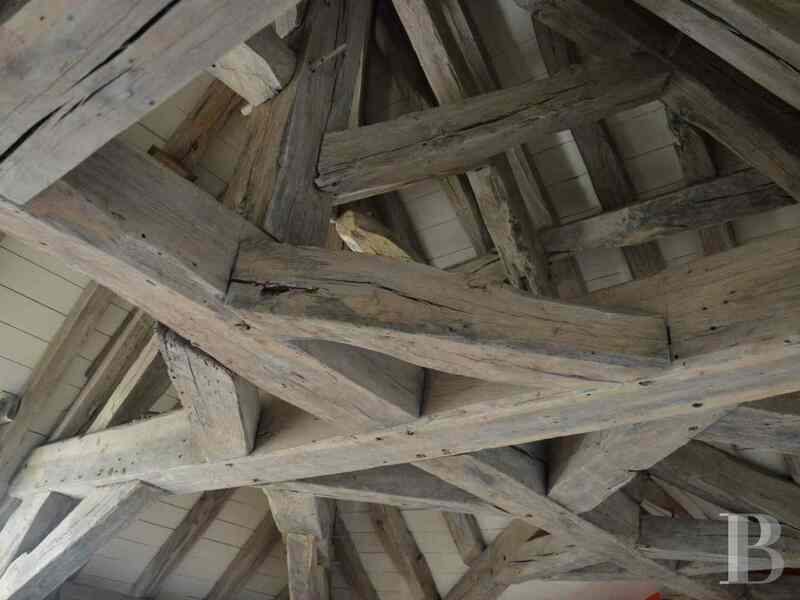 The outstanding beams of the roofing framework are exposed in all three bedrooms. 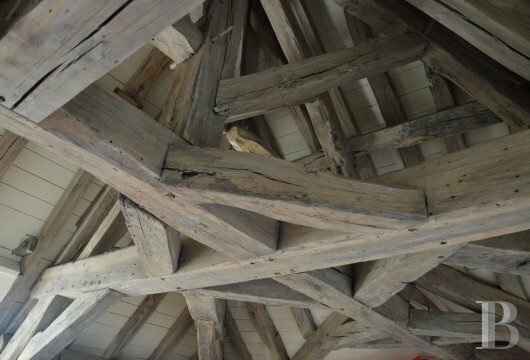 The attic awaits completion of its conversion works, but the insulation and the plumbing for four bedrooms and their shower rooms are already done. The outbuildings comprise a building spanning approx. 115 m² containing a 2-car garage, a home cinema, a boiler room and its supply silo; a farm shed for storing the wood chips; an L-shaped building, spanning approx. 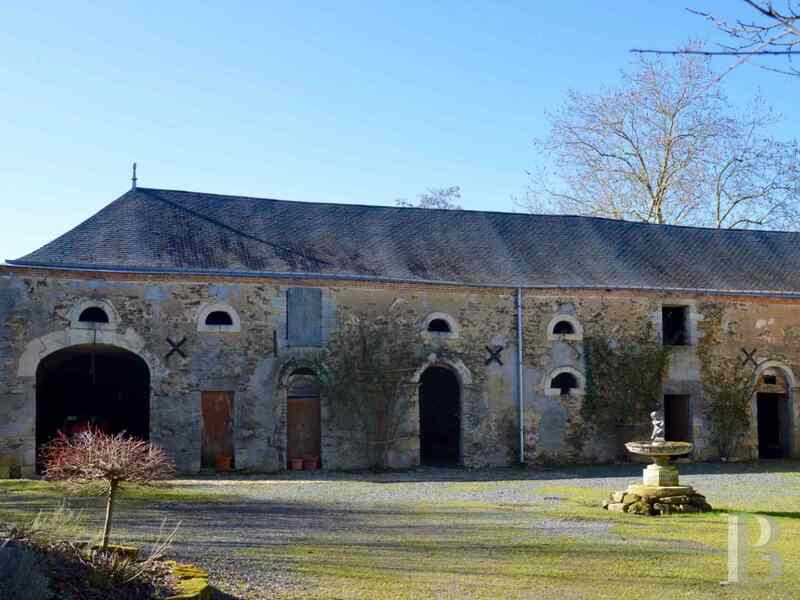 300 m², which houses the old barns and stables as well as the caretaker’s accommodation which awaits restoration. 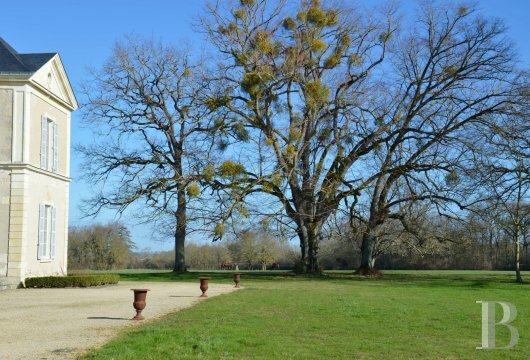 The parklands, spanning a little more than 20 hectares, were designed by André-Leroy, the famous local gardener behind the 19th century landscaping revival in the west of France. 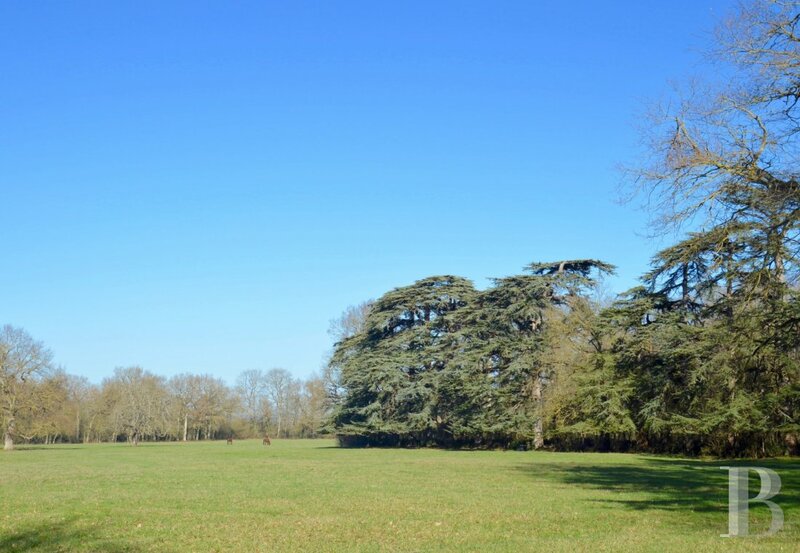 These landscaped parklands comprise vast grasslands bordered by copses of various species (cedar, oak, plane, lime, sequoia, elm, etc. ), thus creating outstanding view points and extended views that are appreciated courtesy of the alleyways. 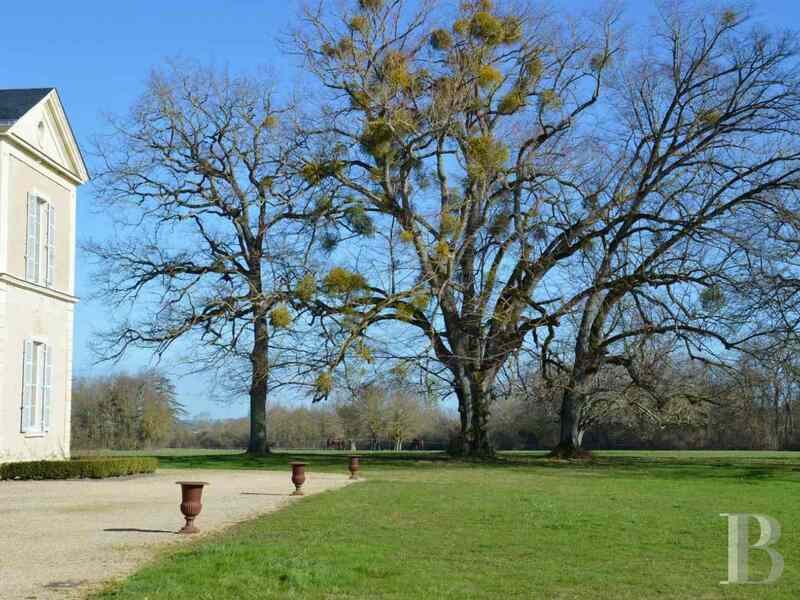 They also include a lake and, near to the chateau’s old chapel, a walled vegetable garden with an orangery. 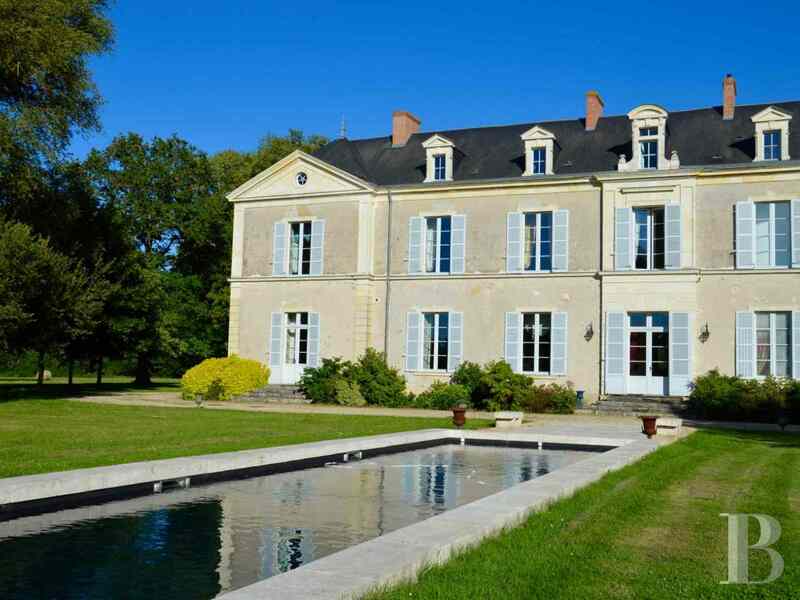 The tennis court and the swimming pool are laid out near to the chateau. Three wells spread throughout the parklands are sufficient for watering purposes. 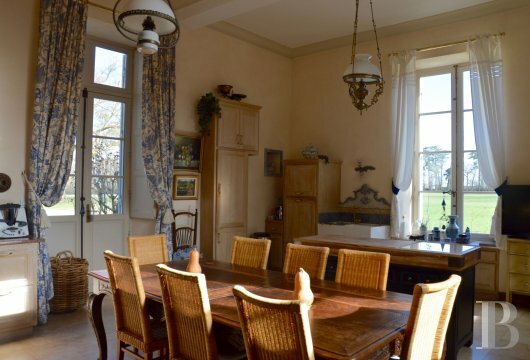 Although constructed in the 19th century, this property is more in keeping with the previous century courtesy of the regular layout of its facades and nature’s idealised representation in its parklands. Its atmosphere brings to mind that contained in “Affinités électives” (Kindred by Choice), the novel by Goethe. There are, therefore, refined places in the countryside where “la vie de l'esprit peut agréablement s'épanouir” (the life of the spirit can pleasantly blossom). This particular place would have been much appreciated during the Age of Reason. 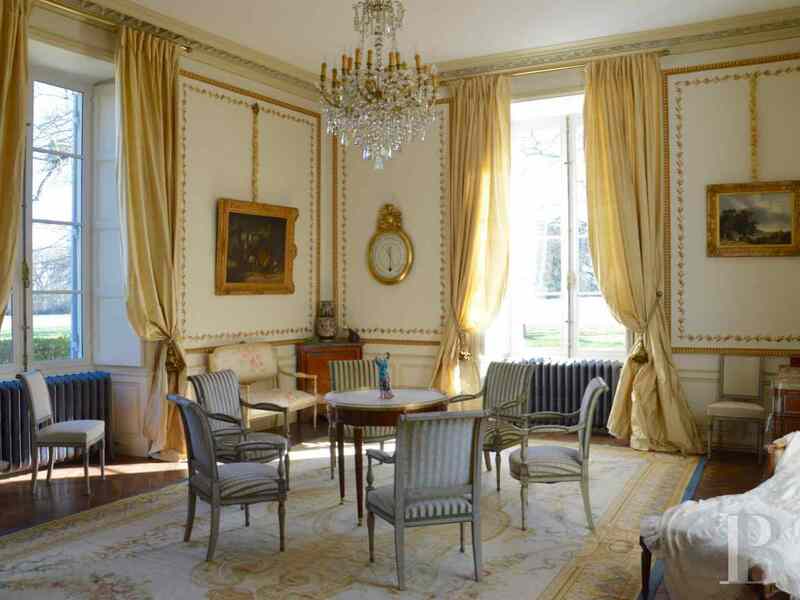 This residence is now very comfortable following major and precautionary renovation works. 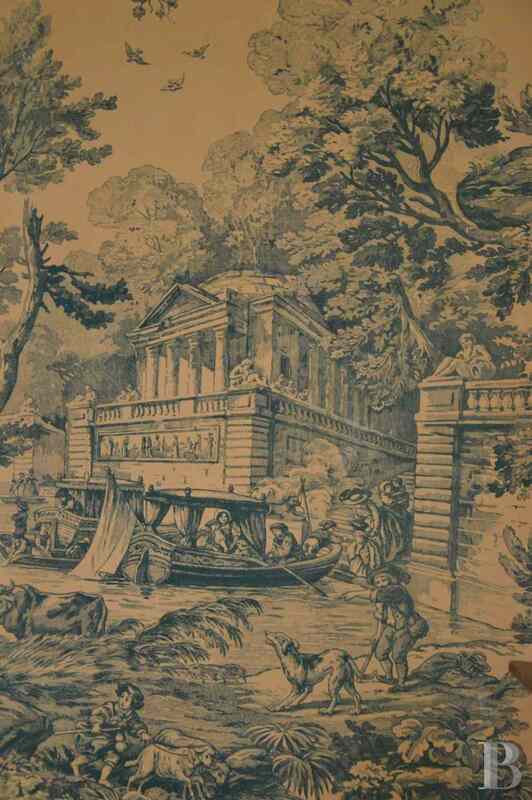 Demanding requirements of modern-day life have not been sacrificed for aesthetic pleasure. 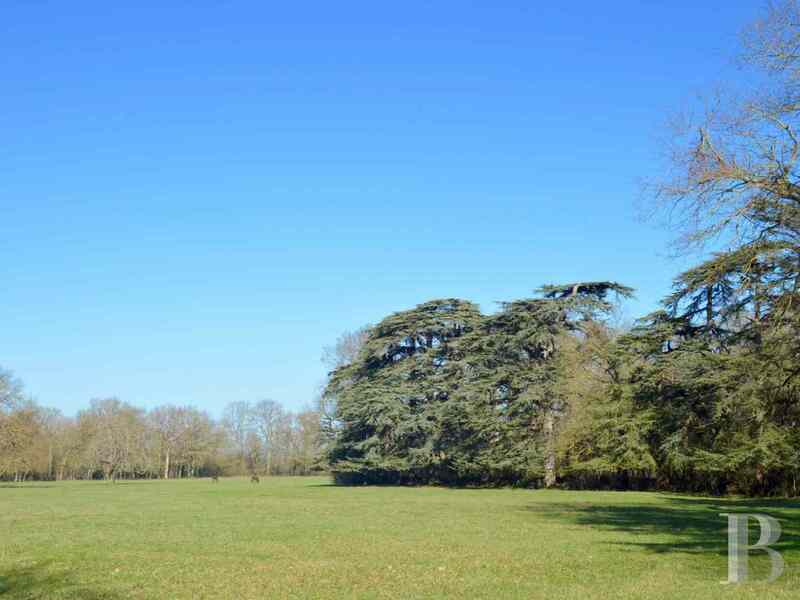 It is also possible to purchase a 39.9625 ha wood for €365,000 over and above the asking price.